Hola amigos! We are still on holidays in Mexico, we are having such a good time that we do not want to go back to London, but soon we will have to face reality and we will have to go back 🙁 but in the meantime I am trying not to think of that and we are enjoying our time with my family. Today my brother-in-law is in town! And he is the expert on making prawn ceviche, so I asked him if he could do some and he was more than happy to make it and sharing with me the recipe. First wash and peel the prawns. Once it is done, chopped them into small pieces and set aside. Chop all the vegetables very finely, into small cubes. Chop the coriander very finely. Set aside. Once all the veggies and prawns are ready, place the prawns in a large bowl and add the juice of the limes, some salt, pinch of pepper and 1/2 a cup of clamato juice and leave the prawns to cook in the lime juice for around 15 min. Add all the veggies and leave aside for 10 min, so all the flavours mix together. Then once is ready, serve it with tostadas, avocado slices and spicy salsa. 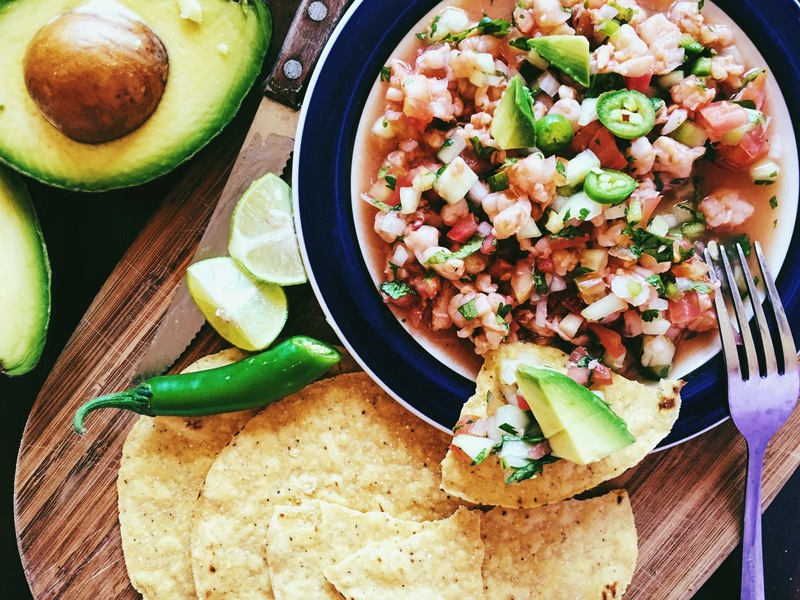 If you want to have it north style, spread some mayo onto a tostada, then some ceviche and top it up with avocado slices and salsa. Oh que rico!!! This sounds so good Karla. I’m going to make it this weekend!